Must Have Plug-Ins Spring 2016 | McGowan Soundworks, Ltd. Given that this lovely Sunday here in Los Angeles is a quiet day for me, I thought I’d do a little roundup of my essential go-to plug-ins for Spring 2016. A few of these have been around for awhile so this isn’t a “latest and greatest” list of what’s hot and new but rather a list of what I’ve been frequently using recently. There are many more plug-ins that I use quite regularly that aren’t listed here however most of them I could theoretically live without (though I’d be majorly bummed). The 88RS channel strip has been my go to EQ and channel strip for several years now. I originally started using it after first having access to a UAD-2 card and figured that countless legendary scores had been mixed on this console so it’s probably not a bad color to have in a score mix. I love the musicality of the EQ, which is fantastic for general tone shaping of any sound source. The filters are pleasantly shallow, which gives a good subtle shave off high or low end without the result sounding overly filtered. I frequently use the Low Pass Filter to take a bit of the hiss off of orchestral samples as the noise tends to build up a lot in thick sequences using samples. I haven’t tried out the updated version just yet but I may upgrade to it before long. 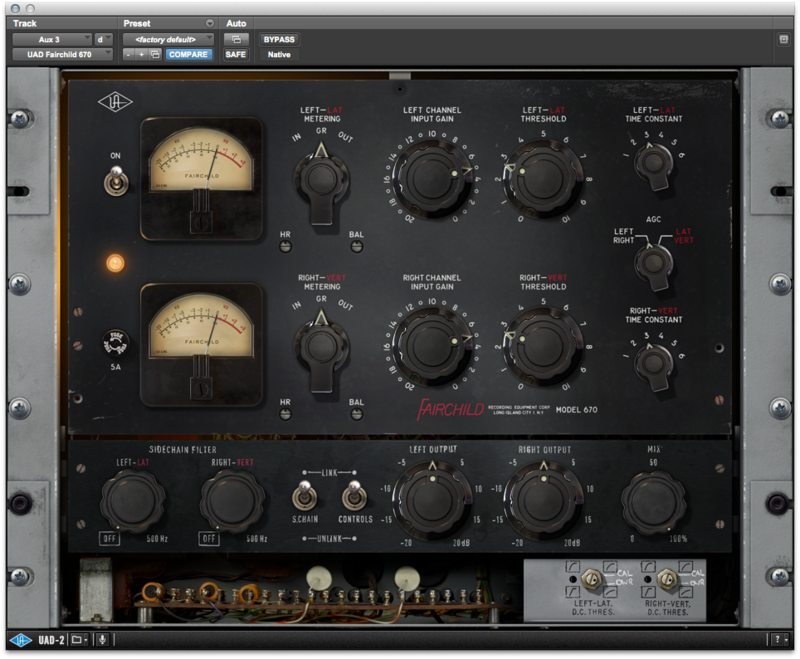 These 3 plug-ins have quickly become absolute essentials in every mix that I do. I first started using Pro-Q after seeing fellow mixer Joel Iwataki use it and immediately fell in love. This has to be one of the most flexible EQs that I’ve ever used and it sounds fantastic, particularly in “Natural Phase” mode. Though it almost feels like cheating, the built in frequency spectrum makes it very easy to find any offensive ringing frequencies quickly and gives you a nice visual reference of what you’re hearing. This is my go-to EQ for anything surgical or drastic given the flexibility of the curves you can create. Pro-L was the next plug-in I checked out from FabFilter and it quickly replaced L3 by Waves as my go to Limiter. Pro-L is typically on every stem master as a safety limiter and also ends up going on the main mix sum as well. The 4 styles offered all sound wonderfully different and make this limiter very versatile for any sound source. I also like how they inverted the direction of the Gain slider, moving up for more input and limiting equalling more volume, which makes so much more sense to my brain than the opposite seen in most other limiters. Last but not least, Pro-MB. This thing can do so much that there is much to its functionality that I have not yet explored. I initially started using Pro-MB as a replacement for C4 by Waves to just dampen certain harsh frequency ranges without EQing but I subsequently discovered that this plug-in can do so much more. 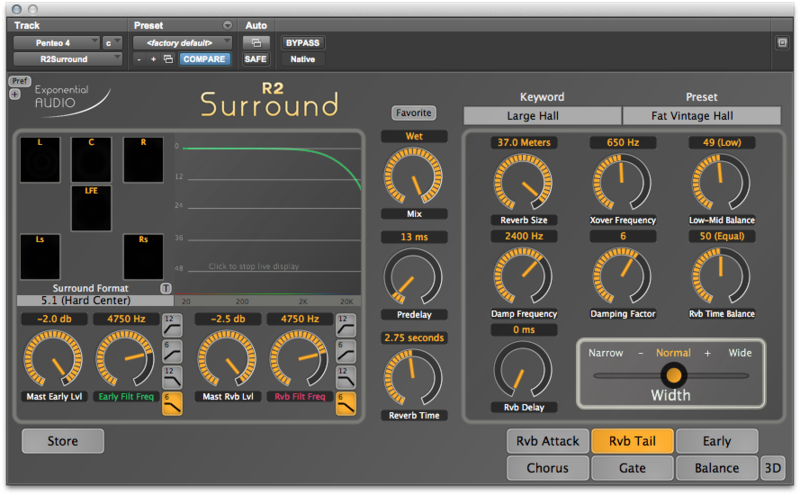 From just putting a lid on a certain overbearing frequency to completely altering the overall dynamic and shape of a signal with some extreme compression or expansion, this plug-in can do a lot. 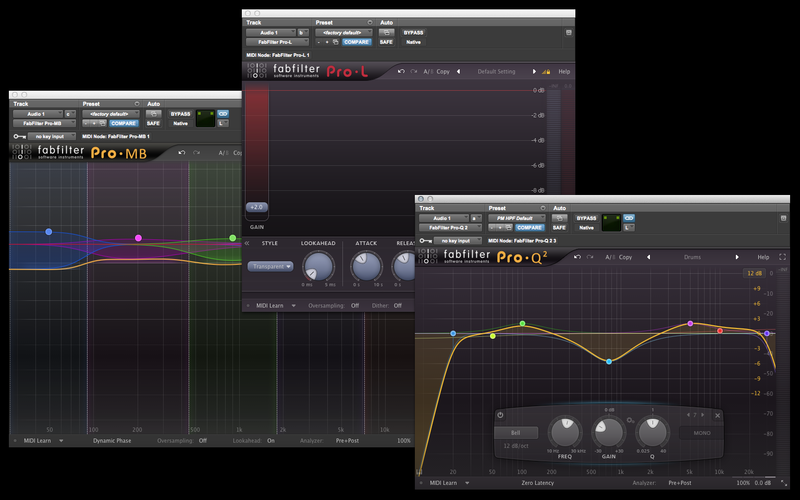 FabFilter has several other great plug-ins worth checking out but these 3 are definite must haves for me during any mix. 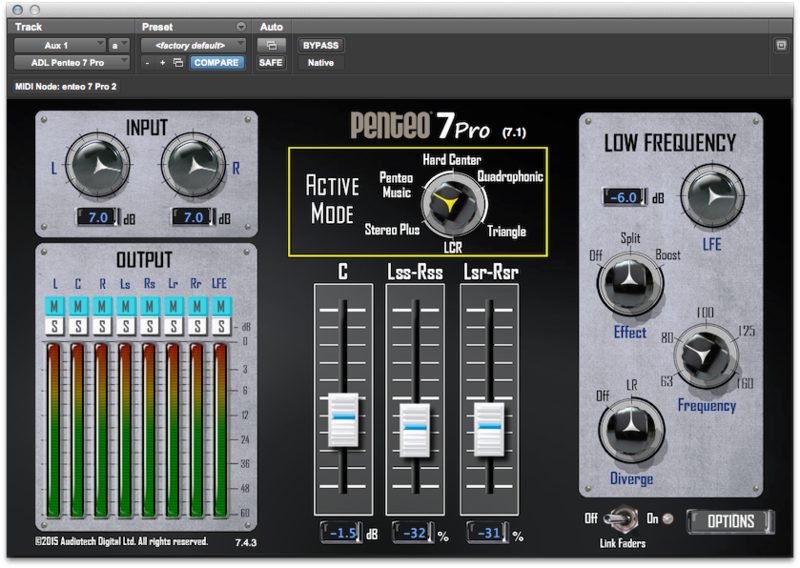 If you’re mixing in surround, you have to get Penteo. My go-to Upmixer for awhile was UnWrap by TC Electronics but when the AAX format completely replaced RTAS and TDM, I was forced to search for an alternative as UnWrap was never ported to AAX. In hindsight, I am so glad that I was forced to seek out something else because Penteo is really incredible. I describe Penteo as having some kind of “Dark Magic” because I really have no idea how it does what it does but I’m almost always pleased with the result. Virtually all of the pre-records that I receive from composers are in stereo and Penteo allows me to spread these elements into the surround field without having to pan elements away from the front channels or add reverb, which isn’t always desired. It really feels like you’ve simply immersed yourself in the middle of any stereo element you send to it without causing things to sound wetter. In the cases where I do receive an element wet, Penteo has the wonderful ability to keep dry elements focused in the front channels whilst spreading the reverbs and delays to the surrounds. The one element I rarely use Penteo for is percussion as I find that it slightly softens things so percussion often loses a bit of its punchiness through Penteo. Every surround mix that I do utilizes Penteo. 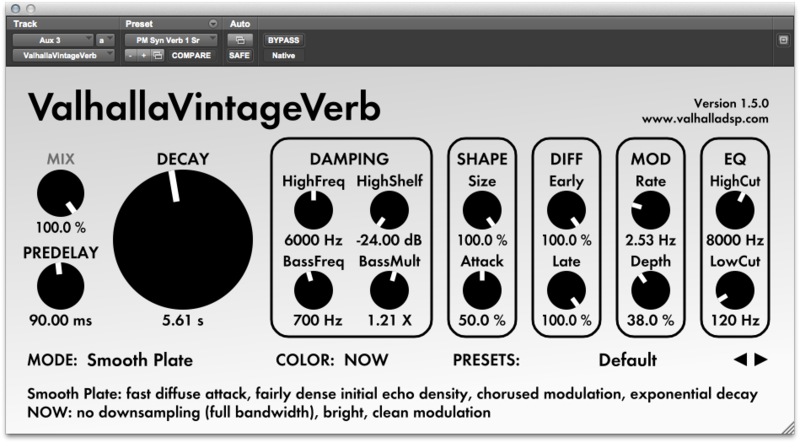 Altiverb has been around for quite awhile and has been a mainstay reverb in surround mixing for many years. 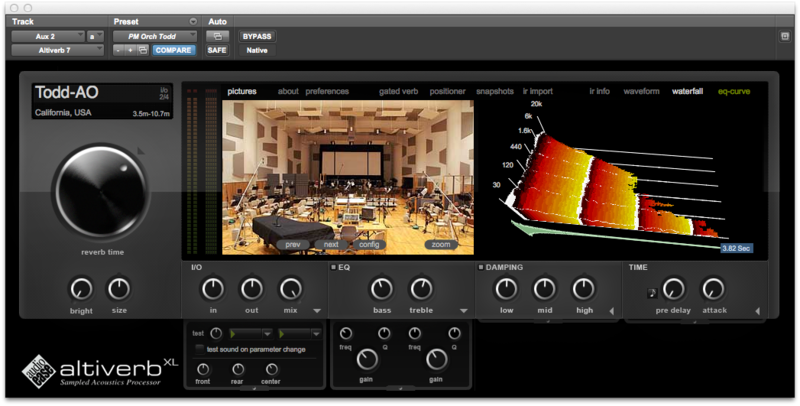 Even though there are many newer options out there, I still find Altiverb to be one of the best surround convolution reverbs available. Altiverb is great at adding space and ambience to a mix and this is primarily what I use it for. The Todd-AO convolution is great for mimicking elements being recorded in this fantastic room without adding a large tail to things. Whenever I mix orchestral elements or percussion that were recorded in smaller rooms, this convolution helps add size and depth to these sounds before adding the overt hall that is typically used in mixing cinematic scores. There are several other convolutions in Altiverb that I use and Audio Ease is always expanding their library of sounds to give you a wide variety of spaces to place sounds in. The only drawback to this plug-in is that there isn’t yet any 7.1 functionality yet. Have $50 to spare? Then head over to Valhalla DSP and buy one of their reverbs. Despite the fantastically low price, all of their plug-ins are incredible. Valhalla Room was the first plug-in of theirs that I used and it became a mainstay in all my templates very quickly. Though I still use Valhalla room regularly, I’ve been leaning on VintageVerb more in recent months. Sadly Valhalla doesn’t offer any surround plug-ins but I end up just using 2 instances for the Front and Rear channels with the Decay and Predelay set slightly differently and it sounds great as a Quad verb. 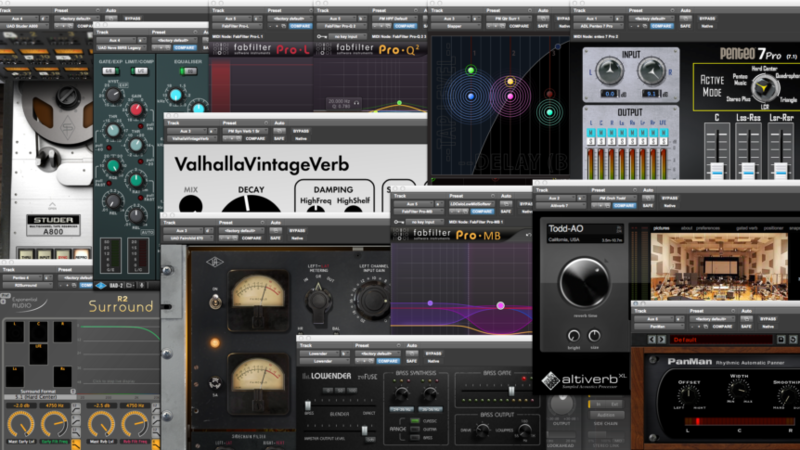 Give all of their plug-ins a try and I guarantee that you won’t be disappointed. Lowender functions for just similarly to the dBx 120A subharmonic synth generator and much of this plug-ins layout hearkens to that unit. I use this as my primary LFE generation tool when I don’t have access to a 120 though sometimes I prefer it over the hardware. The other great use for this plug-in is inserting it on percussion or synths directly and blending in a bit of the bass it adds to really add some serious bottom end to a sound directly. There are a couple other subharmonic generators out there that are great but Lowender is typically my first choice. This is the latest toy that I have discovered and I am absolutely in love. I’ve been searching for a true surround delay plug-in for years and the Kiwis have finally delivered one. Slapper is a very versatile plug-in with 8 delay generators that are all individually adjustable and most importantly, pan-able. The thing that Slapper doesn’t do fully that I’d like it to is allow you to pan the feedback repeats into the surrounds but I’ve figured out ways to use some of the delays to do something similar. This thing is a source for endless fun and creativity. On the topic of effects, the entire SoundToys bundle is a must have for me. 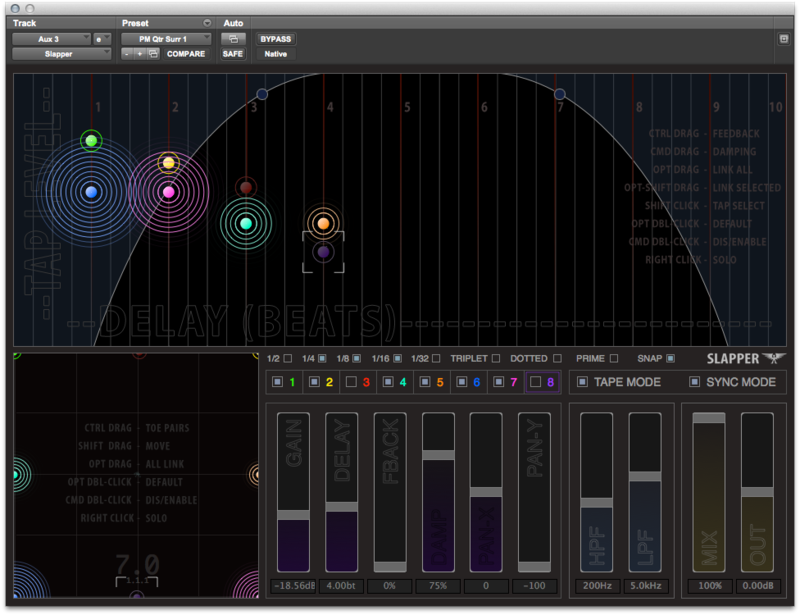 I’ve been using their plug-ins for years and every single one of them is fantastic. Basically any effect that you need outside of reverb is properly represented here. I haven’t utilized the new effects rack very much just yet but I’ve seen colleagues of mine do some crazy effects with the rack that I’ll have to explore soon. 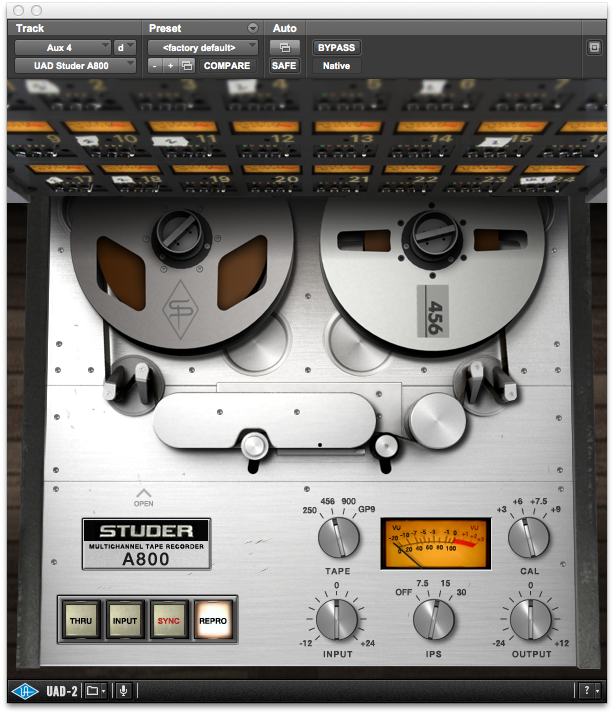 The Studer A800 from Universal Audio has to be one of the best tape saturation plug-ins that I’ve heard to date. Initially I just bought it to try some extreme tape compression and distortion but I’ve found myself putting it across all of my stems so that the whole mix gets a touch of saturation. The effect isn’t immediately noticeable or overt but when I toggle the A800 in and out on a mix, I can hear everything getting slightly wider and deeper in a very pleasant way. The different tape stocks are very useful as well when you’re going for an “older” sound without compromising the overall character of your mix. 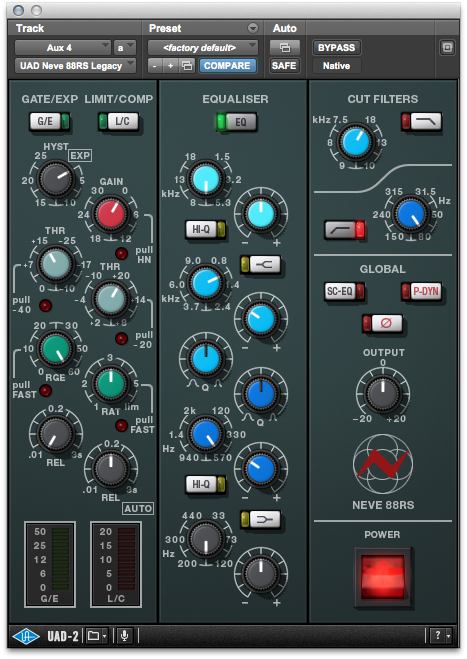 The Fairchild Limiter Collection from Universal Audio is my go to compressor for many things. By far the best model of the Fairchild that I’ve come across. Vocals, Bass, Percussion, Drums, Solo Elements, or really anything else sounds great through this thing. The additional calibration offered at the bottom is useful for really fine tuning the sound of the compression and I haven’t seen that feature on any other Fairchild emulations.